Another Qantas 747-400 has flown off into retirement with the departure of VH-OJI from Sydney bound for Honolulu and Mojave, California, where it faces an uncertain future in storage. Operating as QF6021 VH-OJI took off from Sydney at – appropriately enough – 7:47am on Saturday, with flight tracking website flightaware.com showing it arriving in Honolulu 8 hours 51 minutes later. OJI was delivered to Qantas in December 1990, and operated its last revenue flight for the airline, QF22 from Tokyo-Narita to Sydney, on June 22. 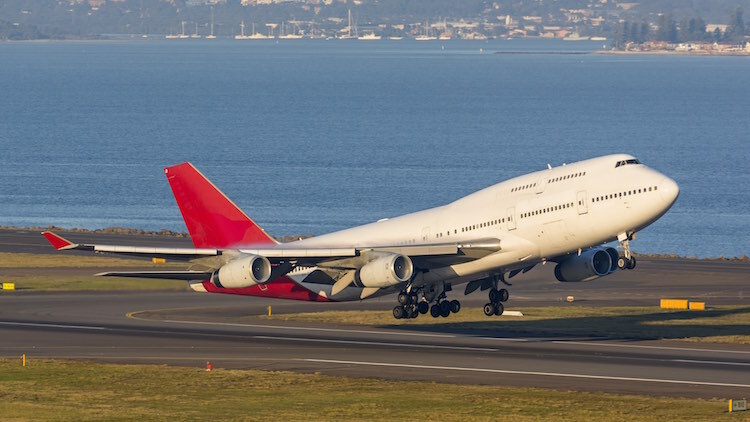 Its departure reduces the Qantas 747-400/-400ER fleet to eleven aircraft (six GE-powered 747-438ERs, four RR-powered 747-438s and one GE powered 747-48E). Qantas has announced plans to reduce its 747-400 fleet to nine (the six -400ERs and the three youngest RR -400s, all recently reconfigured with A380-style interiors) by mid-2016. How long do Qantas plan to keep the remaining 9 747s after the next 2 are retired? OJI is actually off to Mojave, not Victorville. Great shots Lee Gatland! Why did it stop in Honolulu, it has the fuel range to go all the way to California? I can’t understand why it’s taking QF so long to retire the 747. Don’t get me wrong I love the ‘queen of the skies’ My earliest flying memory as a child was a trip to Europe in a SQ 747-200B back in 1987. It is sad to see her go. However these days surely commercial reality has to see her retire earlier than how Qantas has planned it. I don’t understand why they postpone the deliveries of the remaining A380s and yet continue to hang on to 747. If they fast tracked the A380s it would concentrate their fleet around 3 main types for mainline domestic and international ops (737-800, A330 and A380) That would surely save money in the short to medium term. I travel through Sydney airport every month and every time I have seen a QF 747 (or until late last year, a 767) I have thought to myself ‘That is what is wrong with Qantas’. EK and SQ are the the benchmark for fleet development/renewal. SQ retired their last 744 years ago and EK have never flown them. Why hang on to them probably until the end of the decade? I know the 400ER is a slightly newer airframe but even these are starting to get a bit long in the tooth. I know it’s sad, but they need to go. These days profit and commercial reality matter more than ever. Also look at passenger expectations. I look at the aircraft type every time I book a flight. Probably if most people have a choice they are going to choose a newer A380 or even A330 over an ancient 747. They’re also likely to choose a 777 of a competitor over the 747 as well. (But don’t get me started on why QF don’t have the 777). Thanks Scott, the story has been updated. With the retirement of VH-OJI; a Rolls Royce powered 747-438, one must ask with all of these Rolls Royce Powered 747’s being either ‘mothballed’, or scrapped, when is Qantas going to supply the three engines to the Historical Restoration Society (HARS) for VH-OJA. This aircraft is sitting there on display with only ONE engine fitted and after Qantas Engineers removed three of them about a month after it was presented to HARS, one must ask when is Qantas going to actually supply and fit the three missing engines. The aircraft – VH-OJA arrived on the 8th of March, nearly four months ago and it appears that it has been forgotten about, by Qantas altogether. I know through talking to HARS that they are getting very frustrated with the fact that the three engines haven’t been replaced and I know the public who visit HARS and see that aircraft has only one engine fitted are also asking questions. Come on Qantas, it is your interest to have the three missing engines fitted so that VH-OJA is a complete aircraft once more and truly represents the Qantas Brand. Ben blame depreciation rules. See how old planes are in America. I am in the process of doing some bookings for next year and even BA is still flying 767s trans-atlantic. Having a just less than 20 year old plane still flying isn’t that unusual. Asia has much more generous depreciation rules that’s all. @ Ben, Replacing 11 B747s would cost about $30BILLION. I repeat $30BILLION. Does that make their failure to replace the 747 understandable now? What sort of commercial reality do you live in where that sort of money can easily be raised? Also most people don’t look at the aircraft type when they book a flight. Do you honestly think the average person knows or cares about the difference between a B767 or A330 or B777? However, the 747 is a icon that is familiar (in a positive way)to just about everyone..Personally I think the average person is more likely to pick a 747 over a A330/B777. Plus there are plenty of A330/B777s around that are older than QFs 747s. Besides, the thing people normally notice is the cabin fit out and as the article says, QF’s remaining 747s have recently been refurbished with A380 style interiors. On the 767, it’s still in production! Plenty of airlines still use them. Air New Zealand for one, recently announced they’re planning on refurbishing theirs and keeping them on for a while longer. Just to note this frame will probably get scrapped like the vast majority of the other QF airframes. I looked up on AussieAirliners and OJB, OJC, OJD, OJF, and OJO were all scrapped late last year after the 60 Minutes special. OJL, OJN, OJP and OJQ are all waiting their turn to get scrapped I suppose. Thanks for the correction to the story – it is sad to see any aircraft leave a fleet but particularly sad for the 747, especially when there is nothing new coming into the fleet to replace it. Meanwhile, the A380’s are having thier own issues – delays to the LAX last week with a broken A380 (OQD), QF2 departing 12 hours late departing 28 June, plus the problems OQF causes for almost 2 months. The 747’s aren’t going to be around forever to save the day. So Qantas retires another 747, but they had to sacrifice services to LAX to free up one aircraft when they wanted to resume services to SFO. Does this make any sense? @GAGA I think you may have an extra zero in there somewhere. 11 A380s would be around $3 billion not $30B assuming the discounts airlines such as QAN would usually receive. Landed in Mojave about 3-4 hours ago(1500 US time).A friend tracked it in on flightradar24. I wonder what the reason was to fly via Hawaii. I thought most of these flights were direct. VH-OJI had to stop in HNL to clear US Customs as there is not a US Customs office at Mohave. It then overnighted in HNL and was operated with a three man crew. Just returned from a British Airways return Sydney Belfast trip were a relative paid for me to go business. Best flight was London Singapore on the return where I was fortunate to be able to sit in an aisle seat upstairs. Far better thsn the 8 abrest 777. Last time I was upstairs in a 747-200(?) was visiting the cockpit on a BA Singapore Middle East flight in 1985 but, sadly, those days are gone forever. I would like to congratulate VH-OJI for it’s great service to Australia and the world after 24 long years of being on the job with the flying kangaroo. I would like to say thanks to all the pilots and cabin crew who have looked this aircraft throughout it’s time with QANTAS. I am going to miss VH-OJI so much :’-(. Goodbye VH-OJI. I note a comment that the B767 is still in production. I recently visited Boeing Seattle and saw B737, B747 Yes &47 and the B787 in production, but not the 767. I believed the B777 had taken it’s place. aussie0000 the Boeing KC46 Pegasus under construction for the USAF to replace the KC135 is a B767-200LRF with underfuselage boom and under wing hose and drogues. I note the 1st took off from Paine Field and flew to Boeing Seattle. Aussie1000 the 767 is in production as a tanker (quite a few hundred of them) and Gary the A380 is special: spacious (1:8inch seats in economy) and very quite and smooth (more so than a 747) and more so than the 777 people seem to love (for me in a 17inch seat far too cramped). The 747 are fully depreciated and essentially owned outright. Their cost per seat mile on sectors over 12 hours is actually lower than an A380. Their economical life is dependent on fuel price (which is quite low at the moment) and their D checks. It would make no economical sense for Qantas to ‘speed up’ their retirement. A380 may be ‘special’ in a sense in terms of quietness or roominess, but it is not being used for its design range of 6-10 hours. The fuel cost is exponentially higher on the A380 as you fly beyond 10 hours. Unless you’re on a monopoly route such as SYD-DFW, load factors need to be upwards of 85-90 percent to break even. That is a hard task outside peak times. It was not the right choice for the QF route structure, and that has been admitted from the top down. Expect to see none more ordered or delivered to QF, and early replacement before their first major checks. Mark if this is so (A380) why does EK have so many of them. Many routes are around 10 hours but many are also much greater. You need a critical mass of A380’s to reduce overall operating costs to make it work profitably. Also, the majority of EK’s routes are less than 10 hours. 12 aircraft is not enough. Its the absolute minimum. It was a terrible decision in hindsight. Everyone operating them except EK regrets it. @GAGA I appreciate I am not an expert on aircraft depreciation and fleet planning. However as pointed out the $30 billion figure you quote is incorrect. You state that most people don’t look at the aircraft type when they book a flight. I don’t think that’s correct. Most regular flyers would be able to recognise that an older aircraft, say a 747-400, is going to look and feel an awful lot older and noisier and not as spacious as an A380. (Even with the modified interiors). QF modified the interiors of their 767s recently, only to retire them late last year. You also state there are plenty of A330/B777s around that are older than QFs 747s. That’s a rather sweeping statement. The 777 didn’t make it’s first passenger flight until 1995 and the A330 only a little before that. As the article says the retired aircraft was delivered in December 1990. So apart from the newer 747-400ERs it is likely that most of QF’s original 747-400s are older or as old as the oldest 777s and A330s that are still flying. Also as far as saying the 747 is a icon that is familiar (in a positive way)to just about everyone. I agree and as stated in my original post I love the 747. However that does not mean there are not more economical planes to operate. To illustrate the point there are very few foreign airlines that still operate the 747 on passenger flights into Australia (TG I think is the only one that comes to mind that still operates to SYD – But I may stand to be corrected) BA and UA have both changed their aircraft operating into Australia from 747 to 777/787. As for the 767 – Well it may still be in production but only just. It is fast being superseded by the A330 and 787. QF really needed to go with the 777/787 years ago. The big twins are what is economical these days. Why can’t Qantas buy some new Boeing 747-8Is to complement the Airbus A380?The new B747-8I can carry approx 400+ passengers in a Qantas 4 class configuration 50+ more than the current Qantas B747-400/ERs and the B747-8I can fit into more airports than the A380 using the same gates/aero-bridges as the B747-400. Also because Boeing are struggling to sell the 747-8s Qantas could get a once in a life time bargen for the aircraft. 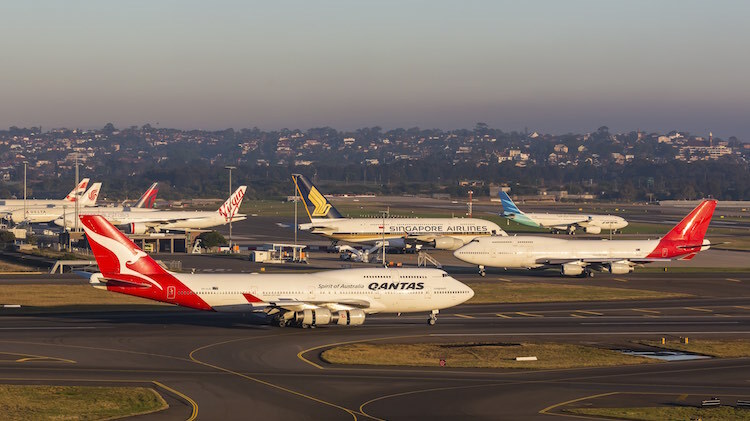 Cost less to buy along with costing less to operate while providing growth to Qantad and airport accessibility it’s a win win for Customers, Qantas and Boeing. Also if Qantas bought the 747-8I it might entise other airlines like BA and Eremites to buy them to that’s even more ensentive for Boeing to heavly discount the aircraft if Qantas bought them. If what the A380 detractors are saying in the comments here is correct, why haven’t orders for the 747-8 taken off? Just climbed off a Qantas flight from Singapore, an A330 in the new configuration. I paid an extra $480 over Singapore airlines ticket price for the two of us. Fantastic plane, great pilots but terrible cabin staff. I fly east west every 3 weeks and always book my tickets with Qantas but the standard of cabin crew over the years is declining.